If baby octopus is not available, you can substitute with calamari. I tried both and they were equally wonderful. Charred octopus gives this dish a great texture and flavor. If you have time, marinate the octopus overnight. But even a short time in the marinade is sufficient. 1. Separate the baby octopus head and tentacles and put them in a bowl or a zipper bag. 2. Add the minced garlic clove, lemon zest, lemon juice, extra virgin olive oil, salt and pepper and mix well, massaging it all with your hands. Keep the mixture in the refrigerator at least 30 minutes up to overnight. 3. Make the herbed bread crumbs: Heat the olive oil in a small fry pan over medium heat and add panko. Stir constantly until panko is golden brown. Do not burn. Remove from heat and add the parsley, mint and salt. Set it aside. 4. Grill the octopus: When you are ready to cook the octopus, heat a grill pan until it's really hot. Or you can use an outdoor grill. Grill the heads for 2 minutes on each side and tentacles for 3-4 minutes on each side until they are slightly charred. Do not over cook. Cut tentacles into quarters. 5. Pasta: Bring a big pot of water to a boil and add a pinch of salt. Boil the linguini until al dente. Save 1/2 cup of cooking water. 6. Assemble: In a large fry pan, heat the olive oil and add the garlic and the red pepper flakes and cook until they are fragrant without burning. 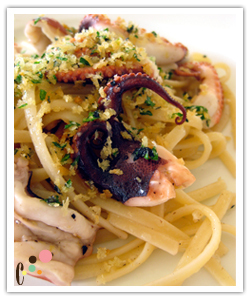 Add the cooked linguini and the grilled octopus and toss well. Add the reserved pasta water and toss everything again. Season to taste with salt and pepper. Plate the pasta and top with herbed bread crumbs right before serving.